The StrechCordz with Leg Straps provides resistance for dry-land leg abduction, adduction, extensions and curls to strengthen muscles and improve swim times. Also can be used in water for resisted stationary swimming. The S1125 heavy nylon strap features a plastic D-ring attachment and adjustable Velcro® closure. Interchangeable. Tubing sold separately. Portable 4ft exercise tubing designed for upper and lower body workouts. The Grudge Belt adds competition to resisted swimming for two-person tug of war, barge pulls and many other exercises. Competitive swimmers get instant feedback to continuously improve their strength (rather than waiting for the lap time). The Breastroke machine strengthens muscles and increases power through outward and inward sweep exercises. Attaches to a diving board, fence, rail or any stationary object. 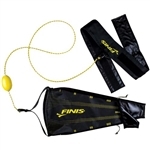 The Technique Training Belt is specifically designed to promote good stroke technique in all aspects of your swimming. Interchangeable plastic paddle. Features plastic paddle and D-ring attachment. Interchangeable. Used in-water with pull buoys for pull sets to control ankle position during kicks. Replacement tubing for the StrechCordz Safety Cord Short Belt. Provides additional length extensions to the Short Belt waistbelt. Adds an additional 20 inches (50cm) to the Short Belt. (Fits up to a 66-in waist (1.6m). 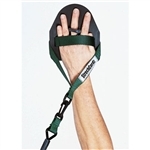 Includes one Strechcordz Safety Short Belt and one Adjustable 6ft Short Belt Extension. Use with StrechCordz Short Belt when a mounting device is not in close proximity to the pool. Provides a 6-ft (1.8 m) length of webbing to reach fence, posts or other stationary objects. Not interchangeable. Used for push-off and stationary swimming in small backyard or hotel pools. Training with the Short Belt enhances endurance and strength for all swimmers. Nylon Safety Cord throughout the length of the tube. Features neoprene padded adjustable belt that fits up to a 48-in (1.2m) waist. Designed for in-place resistance swim training while using lane lines, to train for proper hip rotation; critical to stroke efficiency. Versatile resistance training system for use in and out of the water. Comes with ankle wraps for lower body exercises and neoprene handles for an upper body workout. Aqua Sphere Stationary Swimmer turns any backyard pool into a lap pool. Comfortable Neoprene straps with Velcro closures connect to your feet and ankles to allow you perpetually swim in a fixed position. Use this portable set almost anywhere for full swimmer pull, tricep extensions, rowing, overhead raises, proper hip rotation, stroke efficiency and more. Adds resistance to legs during kick sets. Assists ankle recovery from breaststroke kick and adds resistance to abdominal muscles during dolphin kick. The original dryland training device, used for curls, tricep extensions, flies and lat pulls to enhance speed, endurance and swim stroke. Includes two, 4-ft (1.2 m) dedicated tubes with handles and combination mounting loop. Best selling dryland resistance product designed to emulate a swimming pull, StrechCordz with Paddles, improves IM times and trains swimmers to keep their hands in a flat, relaxed position. Used by the U.S. Olympic Swim Team and swimmers worldwide. Improved for safety and comfort, the Long Belt Slider is StrechCordzs #1 in-water resistance product. Used for resisted swim out and speed-assisted swim back exercises. Replacement Chute for StrechCordz Drag Belt/Tow Tether. Designed for long swim resistance training, the Drag Belt/Tow Tether increases endurance and strength in all swimmers. The drag chute is compatible with flip turns. This unique design provides resistance with drag chute (included).